Shoes N Booze: Don't Mess With Me Monday/ Shoe News: Duck, Dubya! Don't Mess With Me Monday/ Shoe News: Duck, Dubya! We interrupt regularly scheduled images of gorgeous shoes and divine drinks to bring you this video. During President Bush's farewell visit to Iraq, one journalist was clearly displeased with Dubya and decided to show it with his shoes. Now, here is your normally scheduled program in its entirety. Got a case of the Mondays? Well, if you were the type, you could do what the guy did in Iraq. You love your shoes too much for that, though, and the heels you wear would get you locked up for wielding a deadly weapon. Still, you can fantasize about flinging your Maison Martin Margiela nail heeled booties (MaisonMartinMargiela.com for details) at your backstabbing boss. 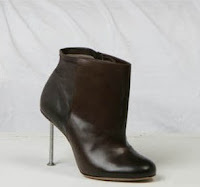 The fact that you'd wear 4 inch nail of a heel means there's something a bit rigid and intimdating, but the dark brown color and simple styling of the rest of your shoe says you're also reliable. Translation: people should tread lightly in your presence and give you space to work your magic (because you make miracles happen, right?). Oh, and the December issue of ELLE says you'll be right on trend because nuts and bolts are a hit this season. Celebbrate your having made it through the day without empaling anyone by getting a little hammered. The best way? A rusty nail (photo courtesy of Quamut.com). Have the bartender combine a little Drambuie (or a lot if you prefer a weaker drink) with Macallan (or other incredibly smooth) Scotch, as per the Quamut.com recipe. This isn't your typical girlie drink, so you'll earn points with the fellas when you drink this one. Just don't let them buy you too many, or you may get nailed in a different way at the end of the night.